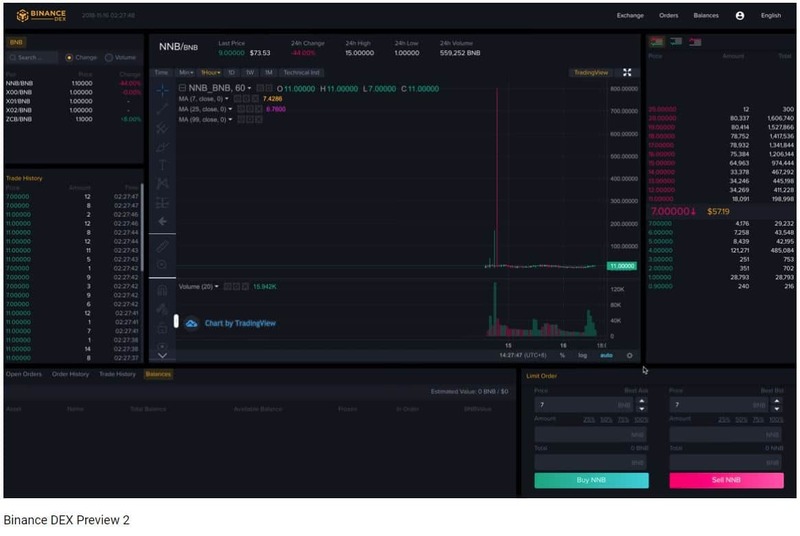 Binance, one of the most popular cryptocurrency exchanges in the world, has released a video demo of its new decentralised exchange. The exchange is called Binance DEX and is due to be released in early 2019. Binance is a centralised exchange which has traded $605 million worth of cryptocurrency trades in the last 24 hours, according to coinmarketcap.com. By any standards it is a very successful business; it opened in June 2017 in Beijing, and by its first birthday claimed approximately 10 million users. It has set up offices in multiple locations worldwide, often accompanied with initiatives with local governments. CEO Changpeng Zhao has predicted $1 billion in profit over 2018. It announced the development of decentralised exchange in March, saying that it could bring “significant improvement” to its customers’ “trading experience”. A decentralised exchange is an exchange which allows people to trade cryptocurrencies with each other directly. This is attractive to customers because they don’t need to keep their money stored at the exchange, where it is at risk of being stolen by hackers. Examples of such thefts abound, and Binance has not been immune itself. In addition to this, centralised exchanges now tend to require customers to reveal their identities, something which was not the case a year ago. Amongst other things, this means that governments can start demanding tax from them. Another negative of centralised exchanges is that they are susceptible to corruption. This can include falsifying trading volumes, demanding money from development teams in exchange for listing a certain altcoin, and giving employees the chance to dabble in a bit of insider trading. Binance’s new exchange is to be built on its own blockchain, the Binance Chain, which will also have other functions, such as a token creation tool. Zhao said on Tuesday that the network will be ready “in months”. The new video shows you how to create a wallet, and how the exchange is operated. It looks fairly similar to Binance’s regular exchange, but has some additional features. Binance’s own token, BNB, is an Ethereum-based token, but will migrate to the new blockchain when it is ready. Binance is not the only cryptocurrency exchange which plans to or has launched such a project – others include Huobi, Bitfinex, and Bithumb.